I like hosting and attending meetups, and usually have a side project or two on the go. I really enjoy running workshops and giving talks. In particular, I love Training from the Back of the Room, and I secretly(ish) try and make every talk I do into somewhat of a workshop. I like asking people to Do Stuff to help them learn a bit more. I read and think a lot about teaching and learning, and keep a checklist of sorts that I use whenever making a new workshop. I enjoy sharing what I’ve learned from all the mistakes I’ve made: helping people learn new things, or get better at things they already known. I write about it, speak and facilitate workshops at meetups, conferences, and at clients. I do a few talks and workshops a year, often with a friend who I can learn something from. 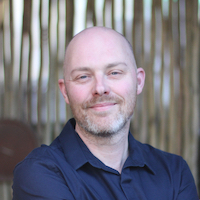 From October 2012 until July 2018, I was one of the organisers of the Cape Town Front-end developers meetup group. The group hosts monthly events such as talks and workshops. 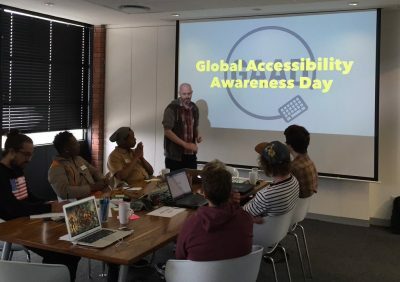 With a lot of help from some friends, I started the Cape Town chapter of RailsBridge: an organisation that offers free workshops on Rails, Ruby, and other web technologies for groups of people that are underrepresented in tech. From April 2013 until March 2018, I helped organise and mentor at the quarterly workshops. Near the start of 2018 I realised I was overdoing things a bit and taking on too much. I decided to take a break from being in an organiser role, and focus more on giving talks and workshops. Here are some recent talks and workshops that I’ve done. March - Get Your Ideas Moving (workshop) at DevConf Cape Town, with Lorraine Steyn; the handbook we made (This was a last minute bonus session, in addition to the published schedule). 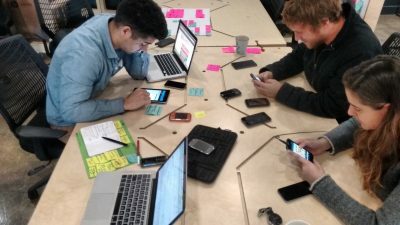 February - Usability testing with no time, no budget and no support (workshop) at Cape Town Scrum User Group - SUGSA, with Cara Winterbottom; our resources doc. 2018 was a busy year! In particular, Nicola du Toit and I went on the road lots of Inclusive Design talks and workshop. November - Workshop at Agile Testing Days in Potsdam, Germany. July - Talk at Make Games SA. July - Talk at UX Masterclass. May - Talk at IxDA Cape Town, our slides. May - Talk at Cape Town Testing meetup, our slides. May - Talk at The IO Powwow, our slides. March - Lightning talk at the Scrum User Group South Africa, our slides. June - HTML pages and CSS layout (workshop) at ColorCode. Workshop deck. May - Global Accessibility Awareness Day (workshop) at CTFEDs, with Nicola du Toit. Workshop: activities; resources; slides. April - “Speak up!”: the fine art of sharing and presenting (workshop) at SUGSA, with Justin Slack: materials. February - Mistakes Were Made (By Me) at the Cape Town Creative Academy; my slides. I’ve been doing speaking and workshops since October 2014. Have a look at my community archive for the full list. I think that a great way to test the robustness and resilience of your site is to play with it on lower-end mobile devices. I joined the Open Device Lab community by starting the Nomad Device Lab in September 2012. It’s a shared pool of internet-connected devices, and is free to use. Every few months someone will contact me through the site and I’ll go and sit with them, usually for a half a day. We test their projects across a range of devices, and discuss ways of improving the front-end performance and user experience. In November 2016, the lab was featured on Smashing Mag: Where Are The World’s Best Open Device Labs? I’m a big believer in building things that are Future Friendly, so I made a tiny site to join the call to arms. You can read more about the technical details of what that means on my How I Do Things page.